Anyone whose vision is not correctable with regular glasses, contacts or surgery to a certain degree is considered having Low Vision. Few people are totally without sight. Most people who are classified as "blind" actually have remaining sight. Thanks to developments in low vision rehabilitation, they can make good use of what sight they have and improve their quality of life. Dr. Mary Ferris works with patients to find the best visual solution to use the remaining sight they have. 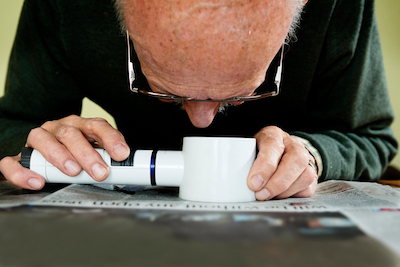 Before a low-vision exam, Dr. Ferris will ask the patient for a complete personal and eye health history. In addition, Dr. Ferris will ask the patient about any vision problems he or she has with daily activities, such as reading, functioning in the kitchen, working, television viewing, attending school, and participating in hobbies. The visit will be tailored to addressing these activities with magnifiers and other devices to help patients stay independent.